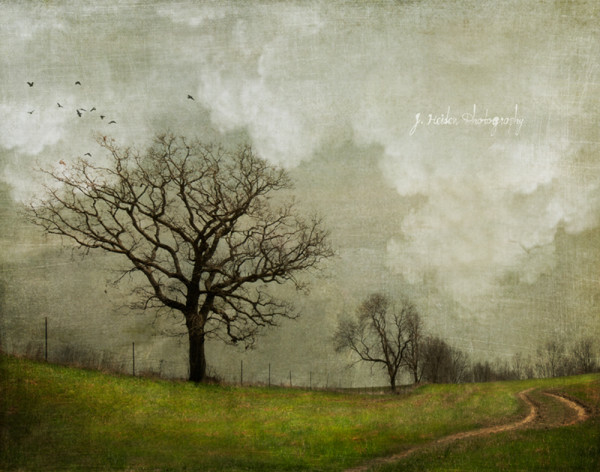 Jamie Heiden is a photographer first. She gets the most satisfaction out of taking a picture. But when she sits down at her computer, the beginnings unfold. Most of her finished images contain multiple photographic layers. Dodging, burning, boosting contrast and adjusting exposure were all tasks performed in the darkroom that are now tools she has at her fingertips using the computer. What would have taken hours in the darkroom can be done and then undone in half the time, not necessarily making the completed process any shorter but allowing for ten times the amount of experimenting within. Her titles are an integral part of her images. She loves the journey words allow us to travel. Simplicity and story are the goals and the lists of artists who inspire include writers, painters and movie directors in addition to her photographic idols.